I've been receiving requests for more Aussie lacquers so here we go! BYS is one of my favourite Aussie brands - they are super affordable, the quality is excellent and they are very readily available. You can pick them up at Kmart hello! It can't get more convenient than that seriously. Today I have two polishes from their new Platinum Nail Enamel range for Autumn/Winter - Buried Treasure and Golden Lustre. 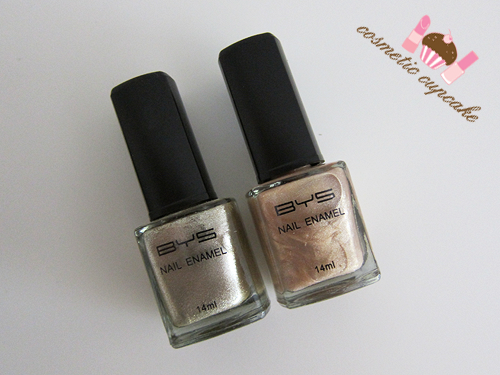 "This Autumn/Winter you'll be sparkling all the way to the tips of your fingers as BYS releases their Platinum Nail Enamel range. It's never been easier to add a touch of glamour to your look! With four lustrous colours, Metallic Silver, Antique Gold, Buried Treasure and Golden Lustre, your nails are sure to look like you've been gold diggin'. The Platinum Nail Enamel range allows you to add as much or as little bling as you desire. 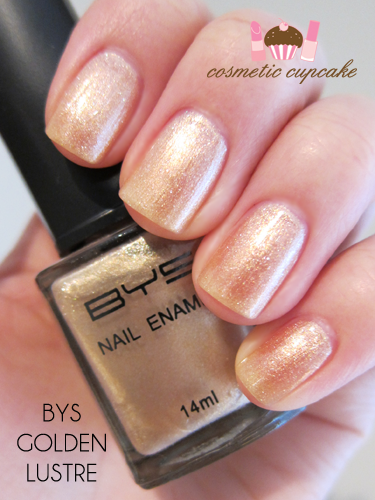 Try Golden Lustre for a subtle sheen or hit the high notes with full coverage Buried Treasure!" 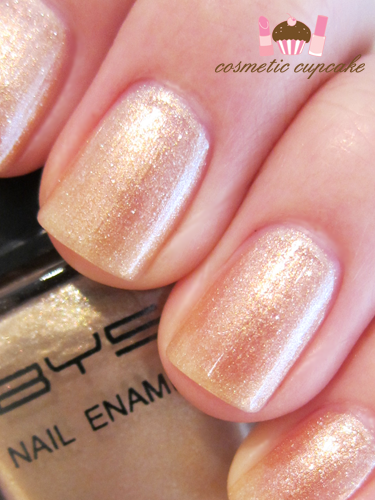 Buried Treasure is a gorgeous sparkly cool gold foil. I LOVE FOIL POLISHES!! One can never have enough in their collection and Buried Treasure is gorgeous. 2 coats is pictured. Golden Lustre is a sheer warm bronze with bronze and blue microshimmer through it. It's hard to see the microshimmer in my pics as it's quite subtle. 3 coats is pictured. 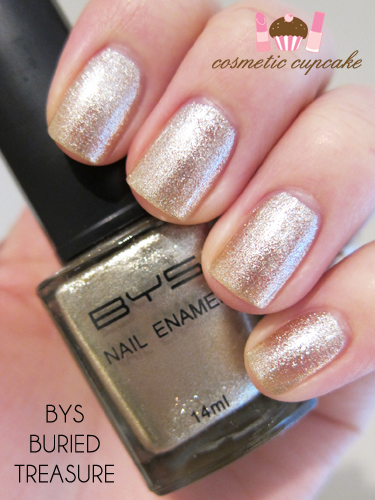 Overall: Buried Treasure and Golden Lustre are great additions to the BYS range and perfect for the cooler months! I really enjoy wearing foils and shimmers at this time of year. They applied wonderfully - the formula was excellent and dry time was very quick. The finish of Buried Treasure was somewhat rough so I'd recommend a coat of top coat. I would have liked to see more colours in the collection as they aren't entirely earth shattering - most brands seem to release similar colours like this at this time of year but these are very well done! 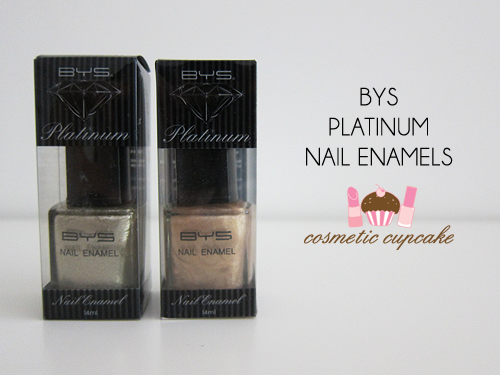 Details: The BYS Platinum Nail Enamels are available now from Kmart, Gloss Accessories, Cosmetics Plus, Ice Accessories, selected pharmacies, specialty stores and online from www.fashionaddict.com.au for $4.95. You can see the full list of Australian stockists here. For international ladies, www.fashionaddict.com.au ships internationally so you don't miss out! You can get BYS at The Reject Shop for about $2. 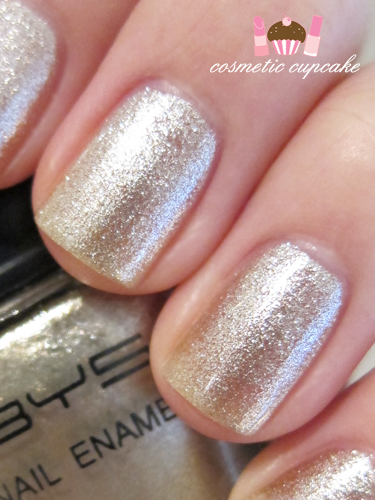 I haven't found a polish by BYS that I love yet. The details on where to buy this collection are directly from the press release. From experience, the Reject Shop seems to only stock older colours and for $3 - $4. You're lucky to find ones for $2! That's disappointing to hear you haven't found a BYS polish you love Jaci. I have many favourites from BYS. I've featured quite a few on my blog in the past. 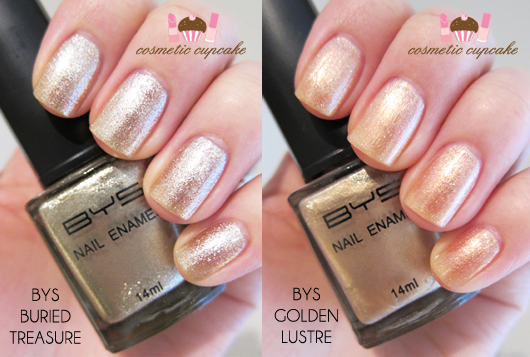 I spied these polishes in a local dlscount store the other day and wondered about them. Thanks for the great swatches 'chelle! you've just sold me on Buried Treasure, I will be going to Gloss tomorrow to see if they have it! I have a similar silver one by Kiko Make up. I like to use a black crackl on top of it. The result is quite "rock". just tried this shade again in different lighting and have a new found love for it, it's a pretty neutral gold and looks great with black stamped over it.